Magura's Vyron Electric Dropper Seatpost is creating a lot of buzz, and for good reason. Finally, a dropper seat post with wireless electric remote control. No wires, no muss, no fuss. You get 150mm of stepless adjustment at the touch of button, with a nice delay function built in so you can easily stop the post at a less-then-full setting on the way up, to fine tune your seated position. This hydraulic post uses an air spring, and the remote pair itself after you simply hold a button on it, and on the post for 8 seconds. The 40 hour run time means you have to maybe charge it every few months, if that. 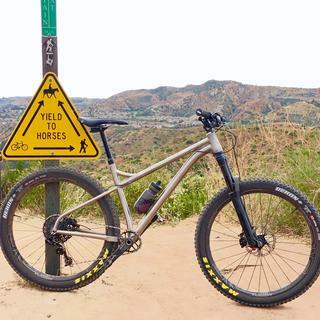 I rode this dropper for 3 days on a test bike in Sedona and HATED it. The actual movement of the post up and down is quite smooth, but the 5 second lag before is terrible. Once you press the button, you must wait until you hear the motor to move the post, and this time varied each press. The mount also sucked. It moves around on the bar, as it is only held in place by a rubber bungee. This post lacked the instant feel of a hydraulic, or cable accuated post. It will leave you feeling left in the dark, looking for your saddle. Not sure why the other guy has a 5 second delay. Mine is less than a second. Consistently, been using it for over 6 months. No problems at all. If I was him, I would send it in. I agree on the control mount being kinda cheesy, A good otb crash it may go flying. But mine doesn't move. I figured I would rig a zip tie if needed. Also, I love the battery life! Awesome product! Might take some getting use to it. In actuating the dropper. But other that looks good and a great product. I will consider buying it again in the near future for another bike build. I will recommend it to my riding buddies. Its an awesome product. Actuating the dropper may take some getting use to it. Here's the deal. I didn't purchase this post from this website, but instead from Competitive Cyclist, who has since stopped carrying it because, well, it's a terrible product. The delay I can put aside. The mechanical issues, however, I cannot. The first magura post I had wouldn't lock out in the top position. Sent it back, got a new one. A month later, the new one developed 90 degrees of side to side play. Not ok. I had to twist the head of the post all the way to the right to fix it. So far, it has been working, but I will be returning it in exchange for a PNW bachelor or Crank Bros highline.